Annatto pigments are given 'annatto' name because these pigments are derived from Annato shrubs. These pigments have reddish-orange colorant. This colorant is derived from seeds of Achiote trees. The concentration of annatto pigments in the annatto shrubs, vary from place to place. Natural pigments are produced by traditional methods. These pigments have lower intensity in comparison to Synthetic pigments. Application with few mordants like alumina and iron, has adverse effects on the environment. The liquid waste of natural pigments contains heavy metals which is much more than the desired limit. These pigments are not efficient for coloring of the synthetic clothes. To obtain same depth level like synthetic pigments, natural pigments require a large quantities of raw materials. To ensure adequate wash and light fastness, these pigments require application with different metallic mordants. Betalain Pigments- Betalains are the another type of color pigments which are also derived from plants. These pigments are present in two forms. The first is b-cyanin having purple-red color and in the high concentration. The second is b-xanthine which is yellow in color and in low concentration. These pigments can easily be extracted from plant tissues with water as these pigments are highly soluble in water. The extracted water is then mixed smoothly with ethyl alcohol in 1:1 ratio. The use of ethanol in the mixture is to reduce the enzymatic action, otherwise the pigments will be degraded. Plant pigment like chlorophyll- Acetone is required for the extraction of plant pigments. Calcium carbonate must be present there for stimulating the extraction process. Any other mild alkali can also be used for the extraction of plant pigments. The alkali is used during the extraction process due to neutralizing the acid which liberates from the plant tissues. This neutralization prevents the formation of pheophytins during the extraction process, unless the the pheophytins may block the extraction process. 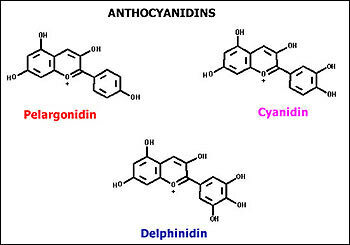 Following diagram is the pigment structure of anthocyanidin pigments (flower pigments).